Leadership is the desire to succeed and the passion to serve. Leadership is not a job. It’s a lifestyle. Leadership is about making an impact on others. Leadership is not what you do in public, but rather what you think in private. Leadership without passion is management. Leadership is having the drive to achieve what others doubt is possible. The role of the leader is to help others see and achieve what they didn’t think was possible. The leader doesn’t view things as impossible. They view the impossible as something merely waiting for a solution. Leaders know their value is not measured in what they do, but in what those they lead do. This video clip is from a speech I gave last December to an audience of business leaders in San Diego attending the Power Train Distributors Association. 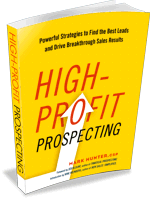 PrevPreviousUsing Voicemail to Prospect: Yes it Works, When Done Right! Spoken like a true leader, Mark. Leadership was never a job and it shouldn’t be. Even Presidents or Prime Ministers or Heads of States should note that even if they are elected as leaders, they shouldn’t treat the position as a job. Instead, it should be an opportunity to serve, to help, to reach out. I think if any leader – government, private sectors, and even organizational leaders – will take that by heart, everything will work just as smoothly. Thanks for sharing an inspiring message!